By incorporating a unique locking mechanism, the Hogue PowerSpeed™ holster is one of the fastest and most secure holsters that have ever been made! The modular PowerSpeed™ system is designed for competition, duty and concealed carry use and is truly universal. 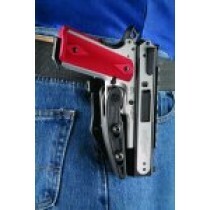 Using only the parts needed for your gun, the PowerSpeed™ holster is easily assembled, within seconds, for left or right hand use and then adjusted to fit virtually any semi-auto handgun! 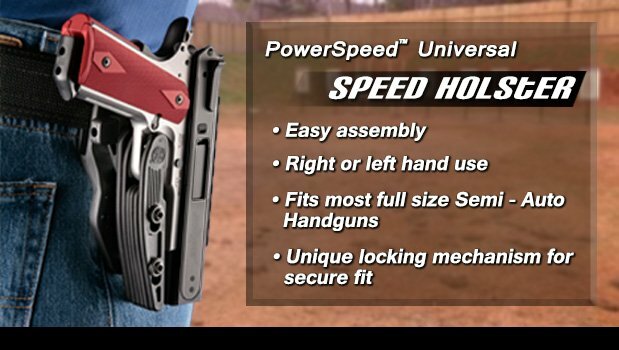 PowerSpeed™ Fits most full size Semi Auto Handguns including, but not limited to: Colt 1911 style pistols, Glock Models, Para Ordnance, Ruger P series, Smith & Wesson auto pistols, SIG SAUER® pistols, Beretta, Taurus, Browning Hi-Power, EAA Witness, Springfield P9, CZ-75, TZ-75, H&K USP, Caspian, etc.